Pete Hanshaw: Model Monkey: Now with Configs! Model Monkey: Now with Configs! 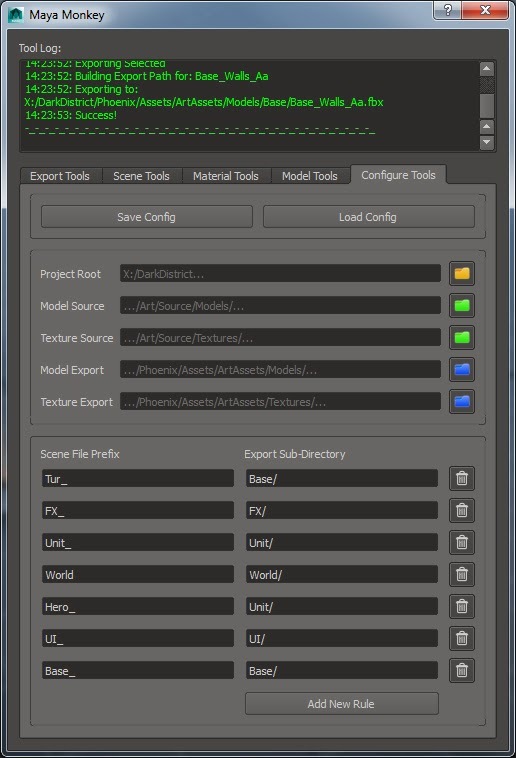 I've decided to use ini files to make it easier to port my Maya exporter across different projects with as little fuss as possible, using the standard Python ConfigParser module. The last time I really played around with .ini files was to mess with Command and Conquer Red Alert, and that was some time ago. It's really awesome that the .ini file format is still worth using today. Part of getting this to work includes creating a GUI interface to minimize the manual file editing that you might expect. Being my first major use of an .ini for a tool (I did use a teeny tiny .ini on Texture Monkey) I suddenly realized that I had to re-work a lot of my previous configuration code in order to make my tool flexible enough to be re-configurable without breaking into a million different lame parts. BUT! It's working now, whoo! A couple of things have to be modified, but I can get info into the tool, change it, and get it back into the .ini again, rinse and repeat. In other words, I can now do what people have been doing for decades! Whoo etc. But hey, it works!